Why Corsica and Sardinia? Sardinia was chosen because it is near Corsica. And Corsica? Before we set our feet there, it was just one of many islands of the Mediterranean Sea for us – just like for many other people, I guess. But as soon as you have spent a week there, you feel the need to go back to that place, longing for it like longing for home, for a beloved person, or for something magical. Corsica is breathtaking, charming with its beauty and variety, frequently surprising. Sardinia is different: full of unbelievably curvy and narrow roads in mountain villages, offering friendly encounters with locals, and marvellous beaches on its eastern coast. We are on the verge of labelling this expedition as the best one we have had so far. Two amazing islands, the whole distance covered by bicycle, no injuries or other mishaps – everything was just great! The results of our bike test were outstanding – even better than we had expected, for we had been afraid of uphill climbs on bikes loaded with heavy panniers. In the end, not only did we successfully complete 99.9% of all climbs (including a few passes at elevations exceeding 1000 m above mean sea level), but we also avoided tiredness and pain after each day's cycling. As our journey came to an end, Lucyna declared that she would never ride another bicycle. After this journey, we know for sure – never trust a guidebook, or at least not the one to Corsica! No guidebook and no photo album will convey the things you can see on the island with your own eyes! If you ever get a postcard with greetings from Corsica, do not think it was modified in Photoshop – the place really looks like that! 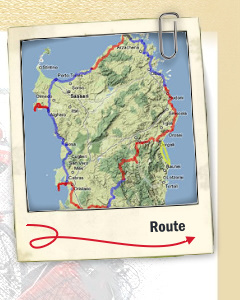 All in all, we cycled a distance of 1650 km – 860 km in Corsica and 790 in Sardinia.